An estimated 100 million Chinese without urban ID records will be able to register in the cities and towns where they live and work by 2020, under a major reform to the hukou (household registration) system unveiled by China’s State Council in July 2014. The announcement, which represents a sea change for China’s internal migrants, will have a significant impact on migrant workers, enabling them to access social services from which they have been excluded, including pension, education, and health-care benefits. A person’s hukou is determined by his/her place of birth and transferring it to another city is difficult. The hukou system prevents China’s internal migrant workers—estimated at nearly 269 million in 2013—from accessing public services in their places of residence and work. Under a goal articulated in a recent urbanization plan, China intends that 60 percent of its population of 1.3 billion will live in cities by 2020, up from about half now. The rationale behind this drive is simple: Urban populations consume more than rural ones. Helping more Chinese settle in cities is expected to boost consumer demand and lift China’s cooling GDP growth. The hukou reform includes a tiered system of restrictions depending on the size of the destination city. Movement to towns and small cities will be encouraged, while registering in cities above 3 million will remain difficult and will be strictly controlled for cities above 5 million. More than 20 cities in China fall into the category of big cities (3-5 million people) and megacities (more than 5 million), including most of the popular migrant destinations, such as first-tier cities Beijing, Shanghai, and Chongqing. As with most policies in China, which often amount to statements of party intention rather than binding promises, the extent and speed of the reforms are difficult to foresee. Meanwhile, a new wave of Chinese emigration is building, consisting primarily of wealthy elites and affluent middle classes. Close to 10 million Chinese left the mainland in 2013, according to the Center for China and Globalization, a Beijing think tank. A recent survey by Barclays Bank found that 47 percent of rich Chinese (defined as those with wealth of more than US $1.5 million) plan to leave their country. A similar survey by Bain and China Merchant Bank found that 60 percent of the rich either considered or had already completed investor visa applications abroad. The primary destinations for Chinese elites are the United States, Canada, Australia, New Zealand, and European countries. Investor and skilled worker visas are among the preferred routes for this emerging emigrant class. Reasons for leaving include the desire for an education abroad, quality of life concerns such as pollution and food safety, fewer restrictions on personal life (such as fee exemptions for having multiple children), a secure means of investing money abroad, and increased opportunities for children. Reacting to the growing outflow of talent, the Communist Party is now reviewing and expanding its policies to encourage return migration of Chinese professionals. China’s signature return scheme, the “Thousand Talents Plan,” has attracted approximately 4,000 Chinese academics from internationally renowned universities to return with a generous financial package and the highly regarded title of “national distinguished expert.” The program is increasingly criticized, however, as some experts are said to have only nominally returned while still spending most of their time and careers abroad. In addition, China’s National Medium- and Long-Term Talent Development Plan aims to expand China’s pool of highly skilled workers, from 114 million in 2010 to 180 million by 2020. A key component of China’s development plan is engagement of the skilled diaspora, seen in such venues as the annual Overseas Chinese Returnees Innovation and Entrepreneurship forum, most recently held in August in Beijing with 500 attendees. China’s government has also been cracking down on the phenomenon of “naked officials,” the expression used for public servants who have sent their families abroad, often to invest and safeguard the family fortunes that corrupt officials are known to amass. Last summer more than 1,000 civil servants were blacklisted as naked officials in Guangdong province, with most losing their jobs. Amid a crackdown against rampant corruption, China’s leadership is watching the growing outflow of its citizens carefully—and taking measures to counter its effects. China’s migration trends are unique in the contemporary era. Globally, low-skilled migrant workers in economically thriving countries come from abroad. This is not the case in China, which satisfies its demand for cheap labor by importing workers from within its own borders. As for China’s skilled and wealthy emigrants, many leave primarily in search of a better quality of life, rather than economic opportunity, which is abundant within China for those with skills, money, and political connections. Thus, it is possible that significant numbers of the Chinese diaspora will return as soon as living conditions in China improve. Migration patterns in China are changing on a large scale and the Communist Party has shown increasing interest and willingness to manage the movement of its population through policy reform. With an increasingly mobile and skilled population, China’s migration reforms will have a large impact within the country and beyond. Baijie, An. 2013. Hukou reforms target 2020: official. China Daily, December 18, 2013. Available Online. Bain & Company. 2013. China Private Wealth Report. Bain & Company and China Merchants Bank. Available Online. Center for China and Globalization (CCG). 2014. Annual Report on Chinese International Migration. Beijing: CCG. Available Online. ---. N.d. 9th Forum on Overseas Chinese Returnees Innovation and Entrepreneurship. Accessed September 19, 2014. Available Online. China Daily. 2014. Xi urged hukou reform in 2001 PhD paper. July 31, 2014. Available Online. China Labour Bulletin. 2013. Migrant workers and their children. Hong Kong: China Labour Bulletin. Available Online. Economist, The. 2014. Ending Apartheid. April 19, 2014. Available Online. ---. 2014. Yearning to Breathe Free. April 26, 2014. Available Online. Jielin, Dong. 2014. What It’s Like to Return to China After Years Overseas. Wall Street Journal, September 1, 2014. Available Online. Li, Zoe. 2014. Crackdown on more than 1,000 ‘naked officials’ in Guangdong. CNN, June 9, 2014. Available Online. National Bureau of Statistics of China. 2014. Statistical Communique of the People’s Republic of China on the 2013 National Economic and Social Development. Press release, February 24, 2014. Available Online. Roberts, Dexter. 2014. Almost Half of China’s Rich Want to Emigrate. Bloomberg Businessweek, September 15, 2014. Available Online. Sharma, Yojanna. 2013. China’s Effort to Recruit Top Academic Talent Faces Hurdles. University World News, May 28, 2013. Available Online. Silk, Richard. 2014. 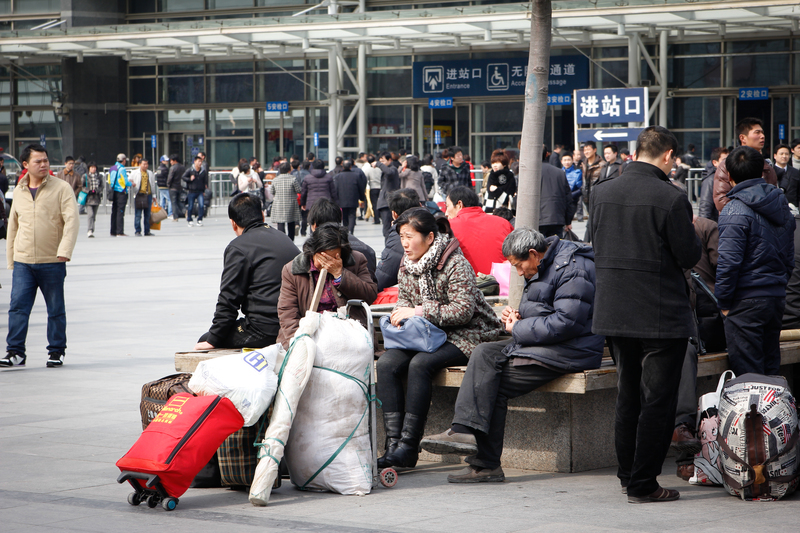 China’s Hukou Reform Plan Starts to Take Shape. Wall Street Journal, August 4, 2014. Available Online. Song, Sophie. 2013. China Now Has More Than 260 Million Migrant Workers Whose Average Monthly Salary is 2,290 Yuan ($374.09). International Business Times, May 28, 2013. Available Online. Wang, Huiyao. 2010. China’s National Talent Plan: Key Measures and Objectives. Washington, DC: Brookings Institution. Available Online. Wang, Zheng. 2013. Why China’s New Rich Want to Emigrate. The Diplomat, November 5, 2013. Available Online. Wei, Yu and Zhaojun Sun. 2012. China: Building an innovation talent program system and facing global competition in a knowledge economy. The Academic Executive Brief: Brain Circulation 2 (1): 6-9. Available Online. Xinhua. 2014. China Voice: Hukou reform to invigorate China’s development. August 1, 2014. Available Online. Zhang, Hong. 2014. Chinese emigration draining wealth and skills, says CCG think tank. South China Morning Post, January 23, 2014. Available Online. Zhang, Jianfeng. 2014. China Focus: Hukou reforms to help 100 mln Chinese. Xinhua, July 30, 2014. Available Online. Victoria Rietig was a Policy Analyst at MPI, where she worked for the Regional Migration Study Group and the Transatlantic Council on Migration.